JUVÉDERM VOLUMA® XC injectable gel is a smooth, colorless hyaluronic acid (HA) gel that contains a small quantity of local anesthetic (lidocaine). HA is a naturally occurring sugar found in the human body. The role of HA in the skin is to deliver nutrients and help the skin retain its natural moisture and softness. The addition of lidocaine helps to improve the comfort of the injection. JUVÉDERM VOLUMA® XC injectable gel is manufactured using VYCROSS® technology to give a specialized smooth-gel filler that produces long-lasting results at the treatment site. JUVÉDERM VOLUMA® XC is delivered by an injection into the cheek and surrounding area of the mid-face to correct volume and fullness. 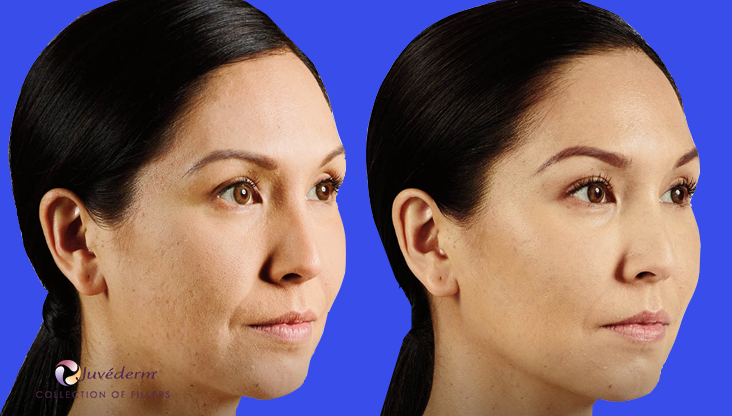 JUVÉDERM VOLUMA® XC is indicated for deep (subcutaneous and/or supraperiosteal) injection for cheek augmentation to correct age-related volume deficit in the mid-face in adults over the age of 21. As you age, the cheek area loses its youthful shape. The cheeks flatten out and the skin may begin to sag. JUVÉDERM VOLUMA® XC injectable gel is designed to temporarily reverse these signs of aging. It is a gel that is injected into the cheek area to lift the skin. It temporarily adds volume to the cheek area and results in a smoother contour and more youthful appearance to the face. It will temporarily correct volume in the cheeks and cheek area that has been lost due to aging and will provide a smoother contour and more youthful appearance to the face. After the first injection into the cheek, your doctor will wait a few seconds to allow the lidocaine to take effect before moving forward with the rest of the treatment. JUVÉDERM VOLUMA® XC will be injected in small amounts over the treatment area until the desired aesthetic outcome is achieved. Your doctor may massage the treatment area gently to assure that the product is evenly distributed. An ice pack may be applied for a brief period following treatment to minimize swelling and reduce pain.